The term “UX design” was created 25 years ago by the director of the design laboratory of the University of California, Don Norman. For Mr. Norman the term symbolized the process of product designing that determines the needs of the customer in every single aspect of its use. For example, the UX of a Tesla car doesn’t only include the interaction between the driver and the car in a given moment but other contents as well, such as buying, maintenance, documentation, marketing, social status and impact on the environment. In the last 20 years, the purpose of UX has changed drastically. The term is used nowadays mostly for the creation of visual interfaces for websites/services, E-commerce solutions or mobile apps. Besides the perception of UX, both design principles and user’s visual preferences have changed radically. We don’t have the opportunity anymore to see interfaces cluttered up with interesting yet unnecessary information, animations (let us remember the animated GIF sprites from the early 90s), disharmony of colors and shapes etc. The development of mobile technologies and interfaces has brought UX to how we know it today. The main factors that had an important impact on its development were simplification and clarity of visual interfaces that not only influenced the visual preference of the user but business goals and new challenges for companies as well. UX interfaces are under the influence of trends specific for this period. It is also noticeable that Netflix doesn’t use coloring schemes properly for which they will get known for in the future (red-black/dark brown). 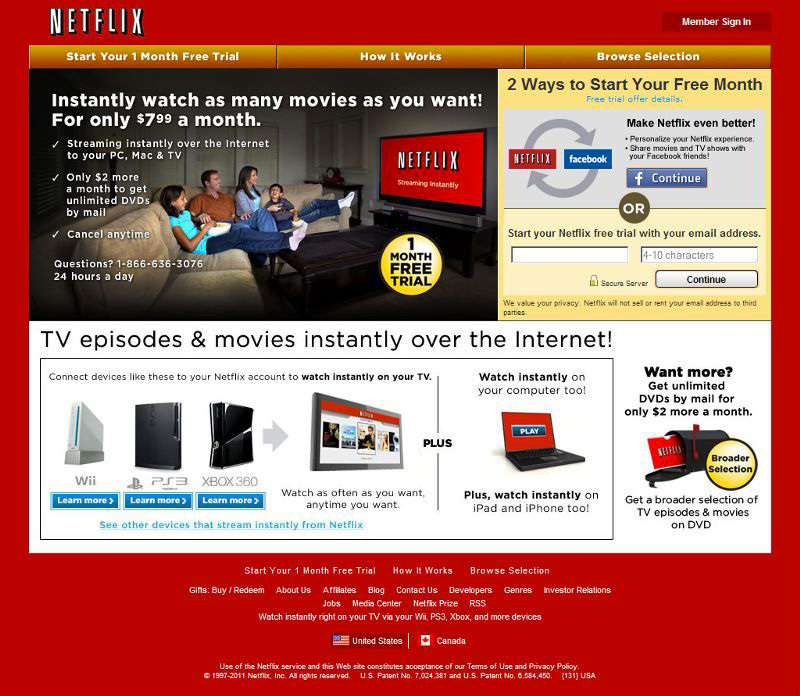 Additionally, the Netflix brand is separated into “Net” and “Flix”, each of them representing a different entity. 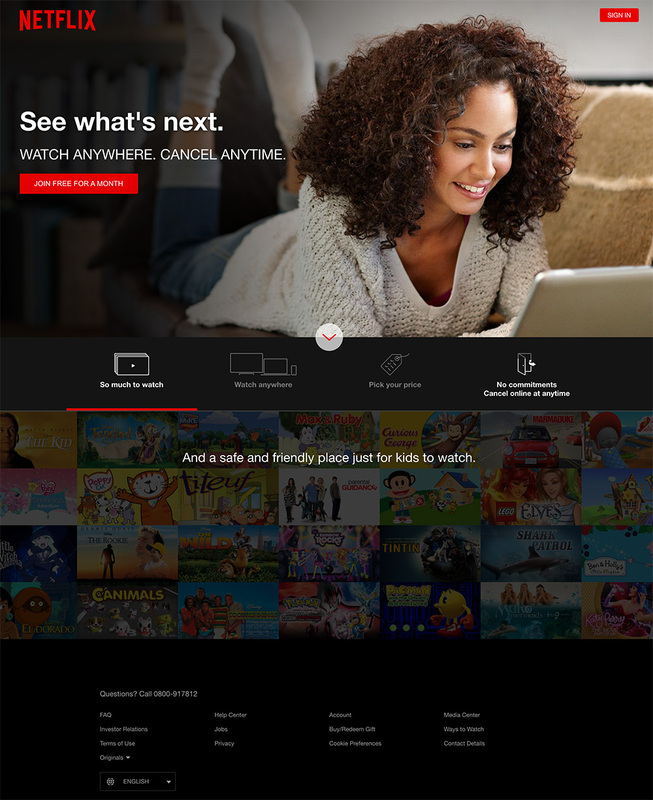 Netflix gets closer to the visual expression we know today. 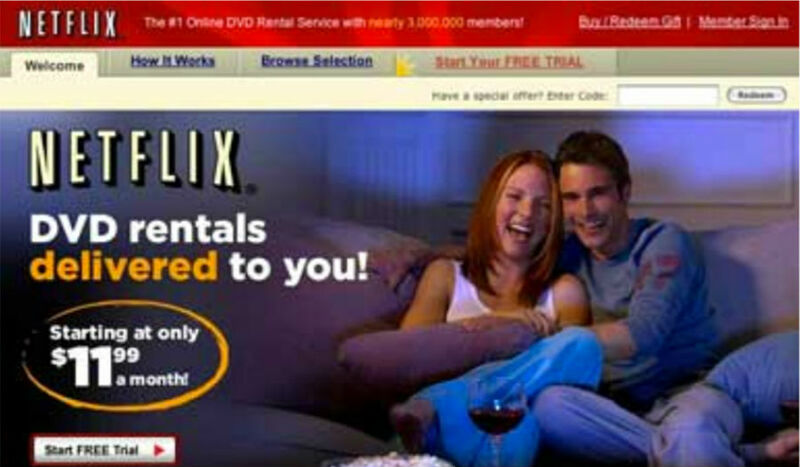 Despite the fact we’re in a time when streaming doesn’t exist, Netflix introduces new ways of renting DVDs that make him stand out on the market, f.e. “No late fees - EVER!”, “Free Shipping Both Ways” or “Cancel Anytime”. The visual expression is considerably improved comparing to the previous version, especially considering the clearness of information given to visitors/users, a simplified navigation non-compromised by a huge amount of unnecessary information. 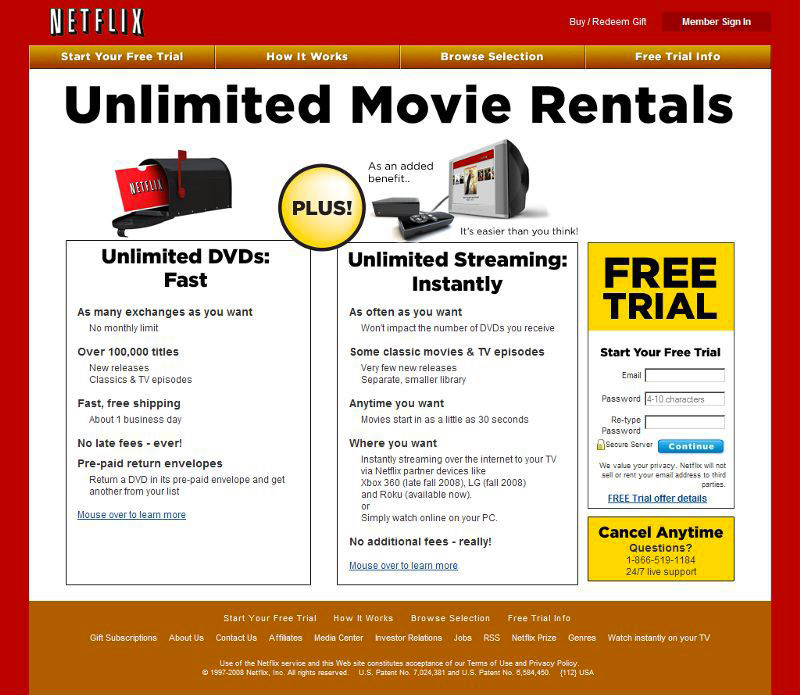 Netflix puts his first real streaming onto the market. My humble opinion would be that the previous version of 2004 had a better UX in general whilst this version aims at a broad target audience likely to start its “Free Trial”. 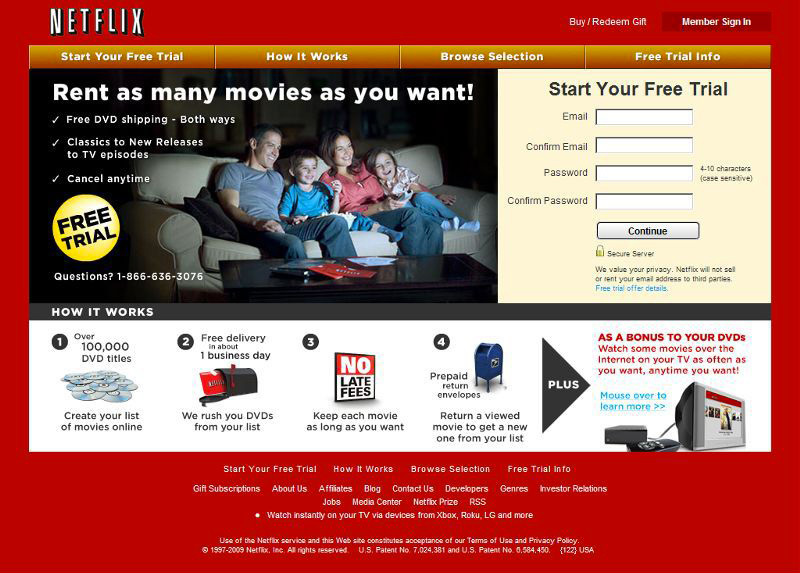 Renting DVDs still dominates Netflix. 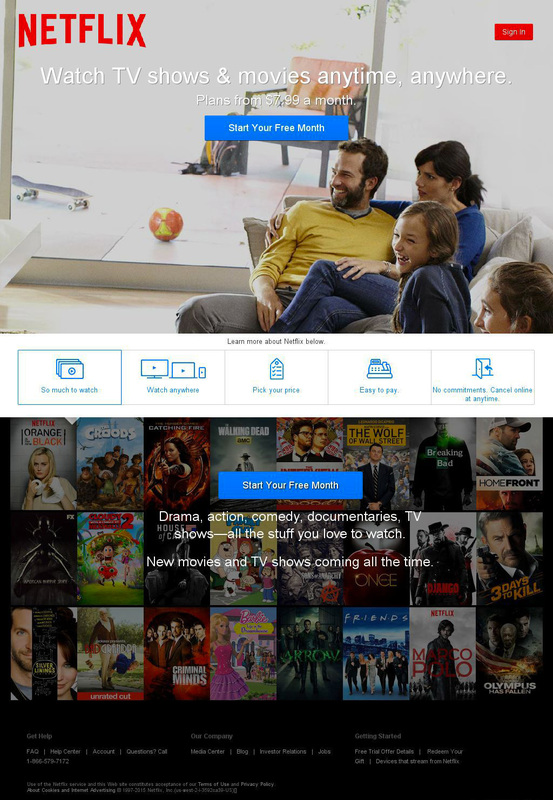 The design of the landing page represents a mixture of the two previous versions. The version remains visually similar to the previous one. 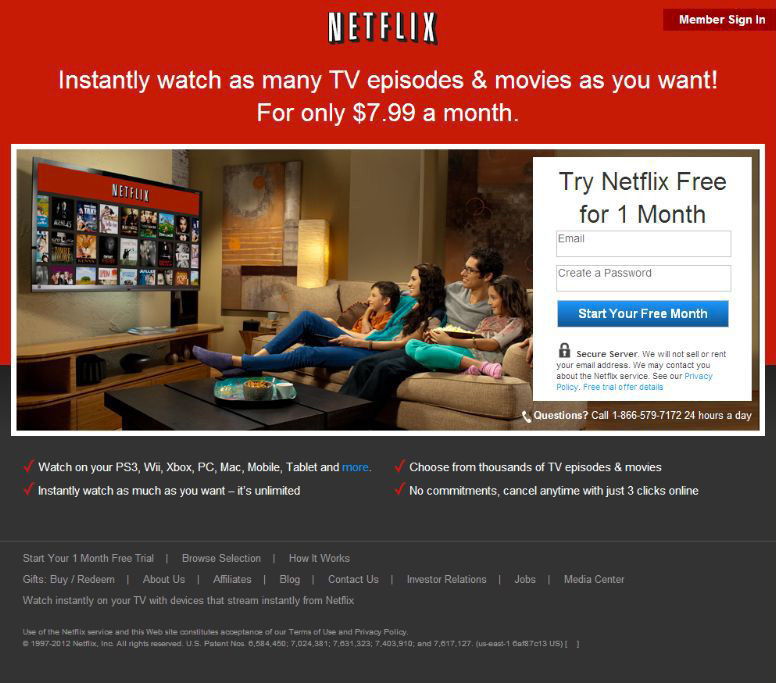 The communication with the visitors to the landing page however is different this time for Netflix starts pushing streaming as its primary service. Besides that, the integration with social networks such as Facebook is put in place. Netflix comes up with a new visual identity that is able to cope with new, modern times. Not only renting DVDs belongs to the past but the reduction of information/text is visible which is understandable for Netflix is already a well-known brand. 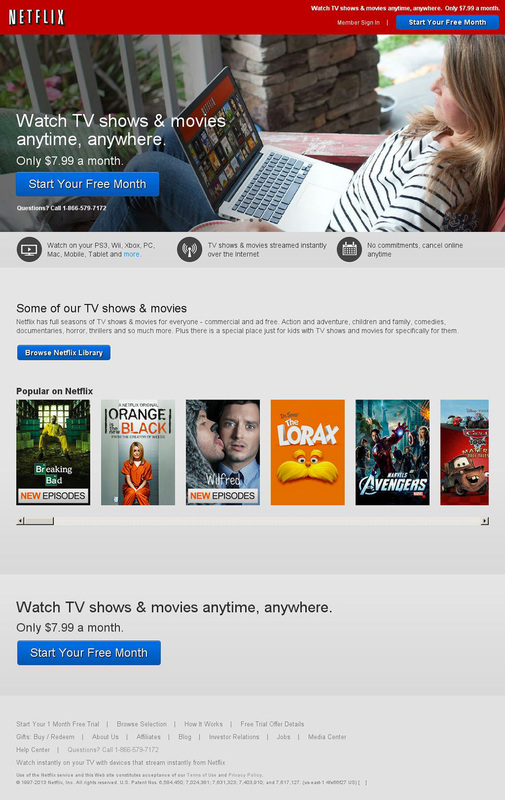 The focus lies on on a big “Hero” photo with a clear Call-To-Action - “Start Your Free Month”! Netflix starts putting emphasis on content of its own production known as “Netflix Originals”. Also, the “Hero” photo communicates a completely different approach consisting in foregrounding Netflix’ omnipresence, provided you have a laptop and access to Internet , instead of using the picture of a happy family as point of departure. Netflix brings back the ideal of the already known happy family but with a slight change - the new photo is more natural compared to the previous “stock photos” the company has been using. A new tabular pop-down track ensures an easier navigation by showing the content in its full broadness and making it more organized. The color fluidity is something that makes this version of Netflix different from the previous ones for the color differences have been reduced to a sustainable minimum. You cannot find any kind of pricing lists anymore and the textual information is shrunken to a couple of text chunks. UX is the key factor in a product’s and business’ success. In order to make this influence on the product successful, it is important to use UX so that it pushes companies to adapt their prices to their customers and their preferences that have a direct influence on the product itself. UX design is becoming an interdisciplinary approach that encompasses numerous factors focused on the development of a product. Visual, interaction and product design, copyright and marketing are not therefore to be observed as secondary elements because they make the success possible.